This was a recipe I just sort of made up to use some of the ingredients we had on hand before we moved. It ended up being a total success! Parker and I both loved it, and it took 10 minutes from start to finish. These quesadillas would also make a great lunch option! *These are roughly the measurements I used, but feel free to adjust to your liking. This recipe does not have to be followed exactly! 1. Heat your chicken in a skillet for 3-5 minutes. It's precooked, so I just do this to make sure the chicken is good and hot for the quesadilla since they cook so quickly. Set aside. 2. Place one tortilla wrap flat in the skillet. Fill with half of your chicken, half of your cheeses, half of your green onions, and half of your sauces and fold tortilla over. 3. Heat each side of your quesadilla 1-2 minutes or until tortilla is golden and cheese is melted. 4. Repeat with your second tortilla. Serve warm with a veggie! 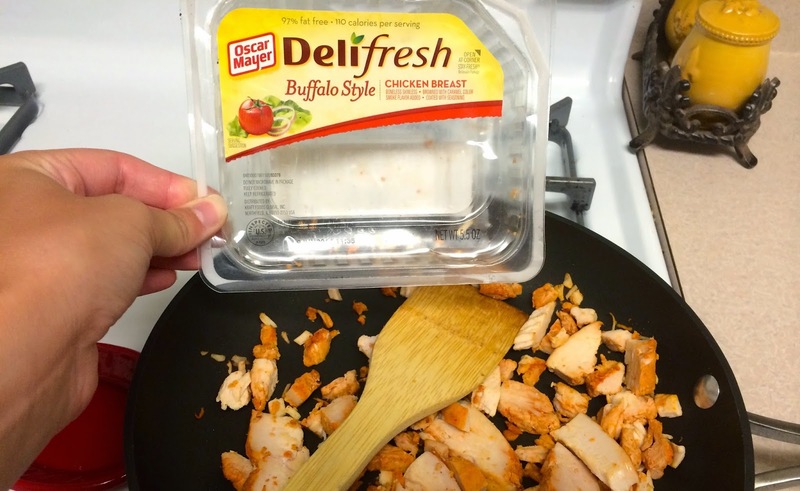 I've never seen deli chicken breast but this looks delicious! I love your buffalo chicken recipes! YUM! Will be trying this soon! I had forgotten about that chicken. I used to buy it a lot! I make a quesadilla recipe similar to this, but yours looks absolutely delish. My mouth is seriously watering right now! These look delicious! I hope I get to make these soon.